This color change chemistry project will give you a liquid that fluctuates between pink and blue as the temperature changes. In essence, it’s a color change thermometer. Mix 3 grams of cobalt(II) chloride hexahydrate in alcohol. The pink solution will turn blue as it is heated and will return to the pink color as the solution cools. Alternatively, heat the solution until it it is just slightly warmer than room temperature. Add water dropwise until the blue solution turns pink. This solution will be extremely sensitive to color changes near room temperature. Aqueous solutions of hydrated cobalt chloride are pink, but formation of [CoCl4]2- produces a blue color. 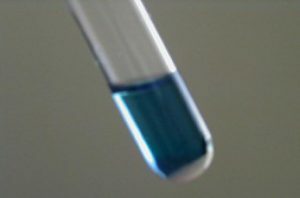 Addition of hydrochloric acid to an aqueous cobalt(II) chloride solution will change the solution from pink to blue as will temperature change of the alcohol solution. This presumably occurs because the amount of water attached to the cobalt ion changes as you vary the temperature of the alcohol solution.